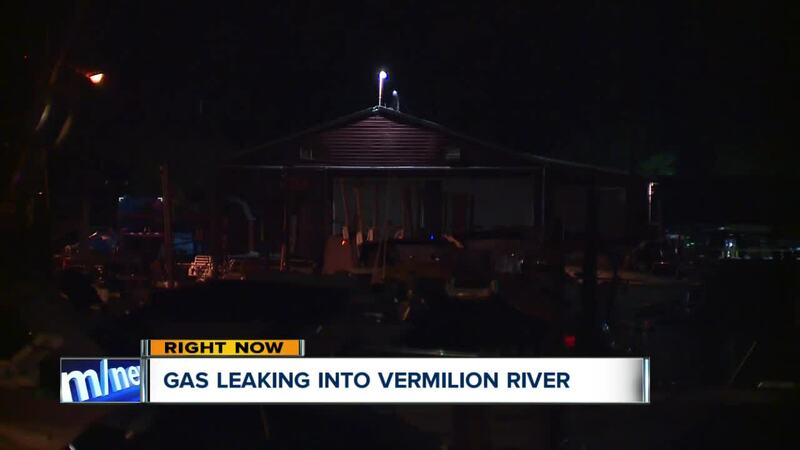 The Coast Guard is investigating a gas leak in the Vermilion River, officials from the District 9 office confirm. Authorities with the Coast Guard were first alerted to the leak on August 17. Master Chief Alan Haraf said their crews worked with the Vermilion Fire Department to secure the leak on Friday afternoon. But additional work needs to be done to clean up the spill. Daniel Forbis, chief of incident manager with the marina safety unit, said the pipe that leads from the ground storage tank to the service fuel tanks at the marina ruptured underground. This soaked the soil under the parking lot, leaking gas into the river. Officials don't know how much gas was left out in the leak. Haraf said they believe the petroleum product leaking out is gasoline from an underwater storage tank, but their office is planning to run more tests to confirm the materials involved. An absorbent boom was used to contain the leak to the Valley Harbor Marina. The owner of the marina is responsible for the clean up process. Haraf said the marina contracted Environmental Management Services to assist with excavation work. Officials don't believe the leak was intentional. However, Haraf said that would be part of their investigation. No one living near the marina is in danger and as of Tuesday morning, no animals have been harmed. The weather will be a factor in the cleanup process.